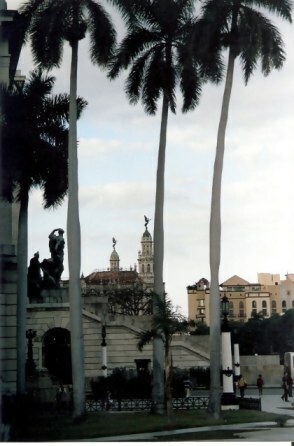 In the early 19th century, Havana was known as The Paris of the Antilles. I understand why and one of the affinities is the number of angels that are watching over you. 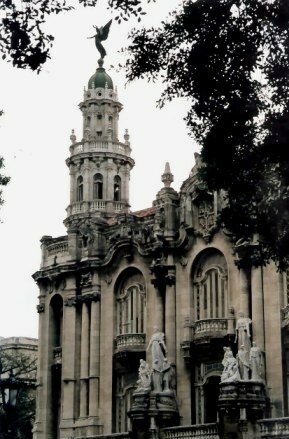 As you walk the streets, Havana angels abound. Each has her own characteristic and context. One of the things about loving photography is that you view each structure through different frames. Different angles reveal something distinctive and special. Each view seems original, striking, and beautiful. The Gran Teatro and her angels set back behind these lovely gates and framed by colonnaded walkways are a good illustration. These angels appear to be always guarding you. 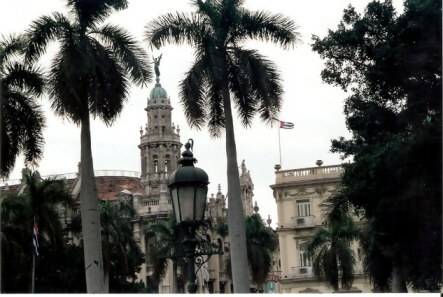 This Havana angel is herself being watched - by a bronze man, from the steps of El Capitolio. Again she appears behind a column in the square beneath. I never tire of the re-framing of something so lovely: here, with the Cuban flag flying. 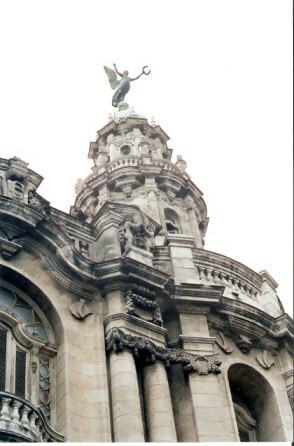 She appears again from behind the façade of the Gran Teatro with its marble statues, including four by the master sculptor Giuseppe Moretti. The Grand Theatre is one of the largest opera houses in the world, with seating for 1500 people. This beautiful theatre holds memories of many famous performers: Arthur Rubinstein and Serguei Rachmaninov, Enrico Caruso, Anna Pavlova - and at the end of the 1870s, Sarah Bernhardt at the time of her infatuation with the legendary Spanish bullfighter, Mazzantini - slayer of over 3,000 bulls. As I look up at the angel from below and think of these famous people, it is Mazzantini whom I find the most fascinating. There was an old Cuban saying to illustrate that someone was strong: he would be said to be "as strong as the bullfighter Mazzantini". To me, that means more than having the physical daring. Who was this man? Mazzantini from an aristocratic upbringing, but had aspired to being a bullfighter. When he acted on this desire and became one, his physical daring was matched by legendary character and charisma. The legacy of having such a saying about a person reflects the uniqueness of his achievements, for he was strong in another way: his strength of mind went beyond the bull ring. On his way to stand as a candidate for Madrid in the Chamber of Deputies, Mazzantini travelled through America. In responseto criticism of the art, he said he did not understand Americans and their horror of the bullfight. He said it was much less brutal than prize-fighting, and could never compare with the brutality of the Russo-Japanese War, then waging. He went on to suggest that instead of organising societies for the prevention of cruelty to animals, America would do better to organise societies for the prevention of cruelty to men. He has a very good point, but I am not sure that the bulls would agree. Mazzantini later became Deputy Mayor of Madrid, a Member of the Provincial Government, and Civil Governor of Guadalajara and Avila. 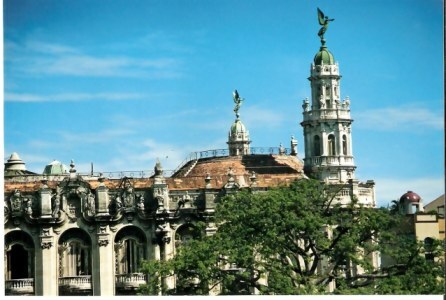 All this I discovered in learning about the angels of Havana. but we dance with angels and ghosts. 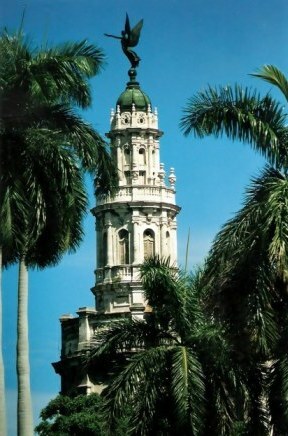 Havana lets your imagination dance as well as your feet. Dancing here you let go of all cares and let the moment take you. That is a gift of an angel indeed. When you leave, the meory remains a ghost in your soul to remind you to savour each step of life.